<strong>EQUIPMENT INSTALLED</strong>: Bridge crane 3,200 Kg. <strong>CAPACITY / DIMENSIONS</strong>: crane bridge of 20 m of light, 37 m of length, 12 self-supporting pillars and variator in elevation. 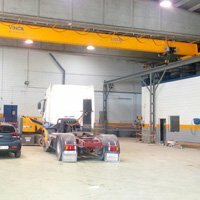 Installation of a bridge crane for the truck workshop. Its main function is to lift the cabins of the trucks for their subsequent repair.